One of my latest interests is something I discovered while in Cozumel on a cruise. I bought a beautiful beaded bracelet. I'd done beading in the past—traditional Native American loomed beadwork—but this was different. A delicate squarish pattern, and not like anything I'd seen before. I didn't intend to figure out how to do it, but I wear the bracelet a lot, and decided that I'd like more. After a little bit of Googling, I figured out that the bracelet was made by Huichol people from the interior of Mexico. I also found additional Huichol bracelets on several websites (Sundance), and in some cases the bracelets were over $200. I also saw that some bracelets online that were clearly a peyote stitch but labeled as Huichol. None of the bracelets on the cart in Cozumel were peyote stitch. They were all a distinctive netting stitch, so I'm not sure if this particular netting style is specifically a "Huichol" pattern. I also found a couple of blog posts online where someone attempted the stitch, but still, nothing like what I'd bought. The bracelet below was made using one of these tutorials, but the EDGES were not quite right...the author of the article showed in the last step to go around the edge of the bracelet, adding two beads between each "point." This method leaves the entire edge attached with a single thickness of thread; I can imagine this catching on something sharp and the entire edge coming off. So now I was on a mission to figure it out. In my first attempt, I found beads at my local Michaels. Michaels carries Toho seed beads, which are decently consistent in size and roundness. They were limited in the number of colors, but I purchased a few colors and played around with the stitch. The stitch was fine, but I was obsessed with the Huichol color patterns. The bracelets in Cozumel had bright, gradated colors. For that look, Michaels didn't have what I needed. I also had the technique slightly wrong. In my second attempt, I went to a local bead shop. They didn't have any of the round seed beads that were consistent. 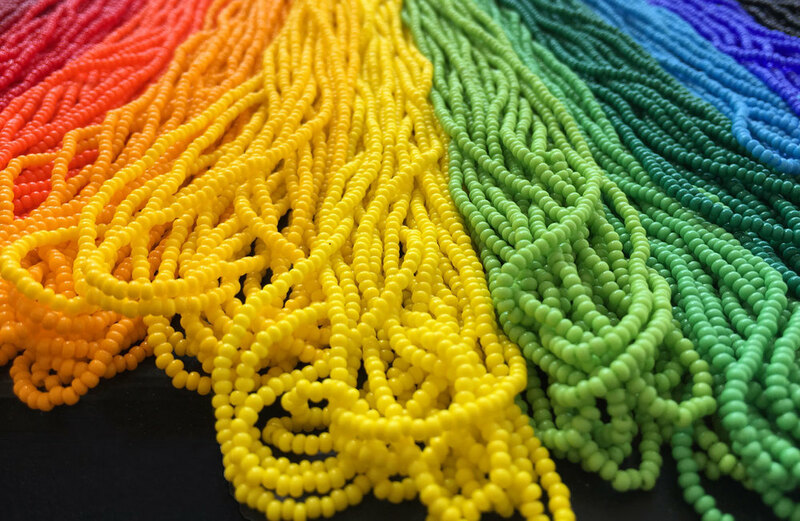 I learned that the tubes of beads were sometimes mixes of different brands, and in the case of the yellow I purchased, some were more opaque than others. The seed beads were also quite squarish, and significantly larger than my Cozumel bracelets. I wasn't happy with that look either. I really liked the delicate round beads I got in Cozumel. One other clue...the owner of the bead shop in Austin suggested that they might be another type of seed bead that was Czech, possibly sold in a "hank" instead of loose. I couldn't find them in Austin, but found Preciosa beads online that were Czech. I still didn't know if this was the right type. Then we went on another cruise, and when I got to Cozumel, I sought out the same cart. I purchased another beautiful bracelet, and happily there was one of the Indians at the cart making bracelets. I didn't get to see how it was done, but sure enough, he was working from HANKS of beads. Mystery solved. By the way, if you find this cart in Cozumel, the prices are very good, and in my opinion they're not charging enough. I always give them and extra $20 and ask that it go to the artist who created my new bracelet. 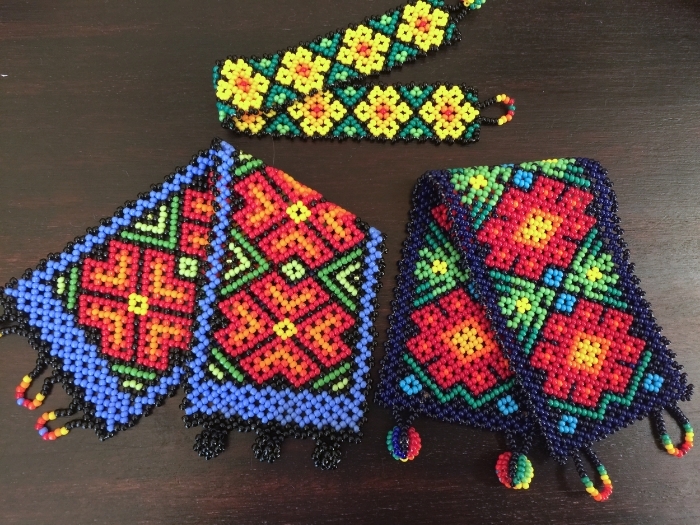 So moving on, I did a little more research, and found an newsletter archive from Preciosa that mentioned that the Huichol Indians use Czech Preciosa beads exclusively for their designs. It was a match. I'd been using the wrong beads! I found two suppliers, Fire Mountain Beads and Shipwreck Beads, so I ordered some colors and waited. I wasn't sure about the size, so I held my breath and ordered 11/0 Rocaille Preciosa seed beads. And I'm happy to say, I've found what I was looking for. These are the EXACT beads I needed. 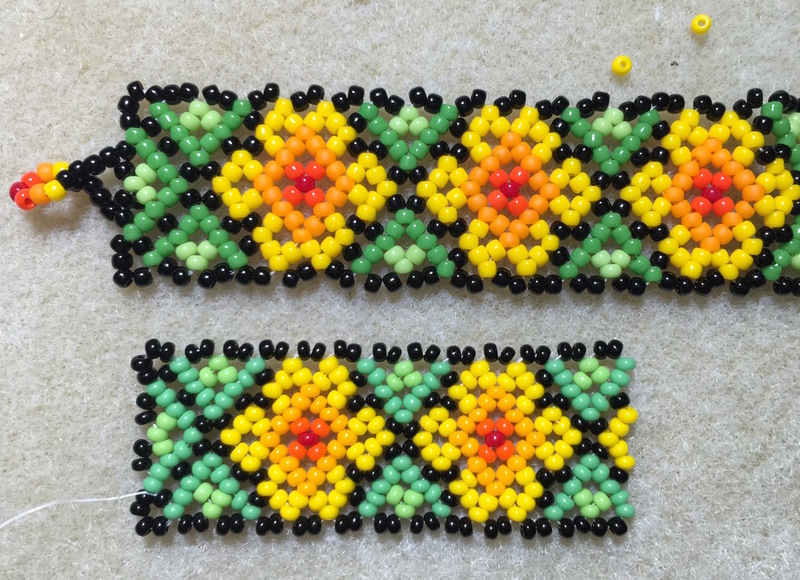 You can see in the example below, the squarish beads from the local bead shop (top) and the same pattern made with Preciosa Rocaille seed beads (bottom). The pattern is definitely a different size, and the one made with the Preciosas is delicate and much prettier in real life. It's hard to tell from the photo. Bottom: Preciosa 11/0 Rocaille seed beads—PERFECT! If you'd like to learn how to do Huichol beading, check out my tutorial here. It shows one way to do it, but I have since found other tutorials that are a little more simplified...for example, in my tutorial, I weave back through the last row. In a new tutorial I just found, the artist uses a knot. It's in Spanish, but click here to take a look. If you close your eyes, you can experience this artist's life...you'll hear roosters and motorbikes and the sounds of a rural Mexican town. I would love to meet this man!